This is version 0.9.2 of the English MIDI introduction page, but I will come by, once in a while, and update it. I will start my Midi page with a text that I wrote to a Roadie course in 1997, when I was a student in an unemployment project. 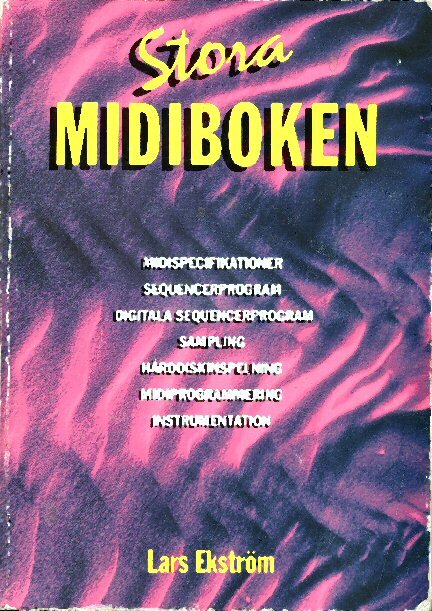 The teacher, who was one of the most talented soundmen in Denmark, did not think that he knew enough about MIDI to teach it to the class. I insisted however that the topic was relevant,( a nice word from the good, old days) and I was instructed to make a presentation to the class. When Martin read paper, he could well see that it was a lot more advanced than he had expected, and he believed that no one else in the class would comprehend much of what I had written, so my writing was delivered to the class members and then passed by in silence. The other students were not interested in technology and binary number systems, but they were good at smokeing marijuana and lifting heavy gear. For many years the text was forgotten and fermented on my Amiga 500, but some fine day it was copied to a PC floppy disk and that version was refined by webmarsters on other web sites such as Soundcheck.dk and put on their web page. I am very grateful towards them, because they have taken care of my text and shown it to the music world. Something that I, at the time, was neither able nor strong enough to do. It is now time that I reveal my self and confess that I am the source. I have been so bold as to copy text from the Soundcheck.dk page, with all the html tags that they have added. This way, I have saved a day of typing and formating the text. I have now refined the text further and added the original artwork from "The Big MIDI Book", so that readers, hopefully, can get the full benefit of my original work. Larsen's illustrations are black and white line drawings, and they are copied with author's permission, while I have produced the colored images myself. From here, I will send a big THANKS for the openness that Lars Ekström has shown in relation to letting me use his material. I hope that I have been worthy, of the trust he has shown in me. This page is much more interesting, if you move your pointer over pictures. The purpose of this text is to give a general introduction to the MIDI stystem and how it is used. In addition, I will take a close look at MIDI time codes and what they do. I will, if I have time and energy, be going into greater detail about how individual codes are designed and what happens when they are sent and received, on the bit/byte level. MIDI is an acronym for Musical Instrument Digital Interface and is a standard for digital music instrument communication. 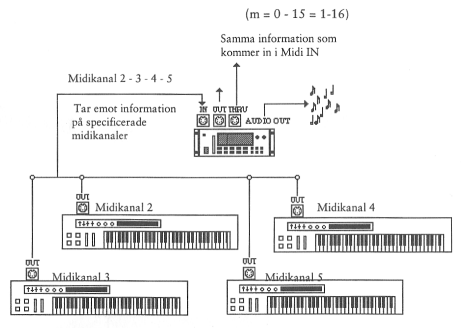 With MIDI, you can send numeric codes through ordinary 5-pin DIN(Deuthe Industri Norm) cables that transmit data between the electronic parts in musical instruments and/or computers. It is recommended to keep the cables as short as possible, preferably less than 25 m each. There is no transferring of audio signals and if you accidentally connected a midi signal to a sound reproducing device, it would sound quite terrible. Graph of the signal of Note-On. A start-bit,a byte and a stop bit. Is able to send information on 16 channels on each connection. This is done by tagging each data package with a channel number. When a MIDI device receives data, they will only respond to the data that is encoded with the correct channel number. MIDI has 4 different MIDI modes (states) each of which have their advantages and disadvantages. They decide which channels are received and how many notesthat can be sent to the reciving device on each channel. There are no real names for these modes, so as to avoid confusion it is best to remember the number. Omni on: All MIDI channels are open. Poly: Play many notes simultaneously. Mono: Play one note at a time per. cannel. Receives data on all 16 channels polyphonicly and play the selected sound on each channel, but only send data only on one channel (usually no.1). This mode has for many years been the standard and in many cases the only option on older keyboards. Receives data on all 16 channels, but play just one note at a time, on each channel, no matter how much data coming in on the various channels. The data is sent to a selected channel. This mode is not very useful and I suppose it only has eligibility for MIDI flutes and other monophonic instruments. Recives on the Specified channel or Channels and play them polyphonicly. Data is transmitted on a selected channel. Together with the "Omni off / Poly (MIDI Mode 3)" code, a set of channel numbers are send, starting from a so called base channel. On the newer machines you can break the channel-set up in several MIDI channels and assign a sound to each channel. If for example an instrument can be split into four parts and send from base channel = 5, it will be able to use channels from number 5 and upwards, that is channel 5-6-7-8 (there were only four). But gradually, however, it becomes more common that you can Specify each channel separately, and choose them freely. Eg. Channel 2-5-10(drums)-12-14. This can also be used if you need to receive data from multiple keyboards at once, to a sequencer or a computer. This mode has gradually taken over the top as the most used. Received on the Specified channel or channels, each of which may play a none at a time. Data is sent on a Specified channel. This is used for MIDI guitars, using a channel for each string. 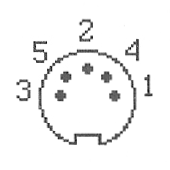 may be recognized by having one or more female DIN connectors marked with MIDI IN, MIDI OUT and MIDI THROUGH. On some MIDI devices, there are several connectors for MIDI OUT or MIDI IN. Some of these devices can send or receive 32 channels (two connectors). This is a data outlet and data is sent to the MIDI IN. Here, it is receiving data from the MIDI OUT or MIDI THROUGH connections. MIDI-IN has a buffer memory of at least 128 bytes of data, that can queue up until the micro processor gets time to process them. If the buffer is too small, data is lost. This vil give problems like hanging notes, when the note-of code is lost. Solution: Send a "all notes off"
From here a copy of the MIDI IN data is forwarded, but not the MIDI OUT data that the device itself generates. Is not seen very often. You can choose between sending normally MIDI OUT (echo off) or send a mix of MIDI OUT and MIDI IN (echo on). With echo on, the two output signals are send to a MIDI merger, that sorts its input in "whole messages" at every 2-3 bytes and transmits them in an orderly manner. However, errors may occur and often to the SysEx type, because they are longer than a standard MIDI message and therefore can be mixed with other data if it does not work properly. By taking the signal from the MIDI THROUGH and send it into the MIDI IN, you can create chains of devices that receive the same data. It is recommended that you do not connect more than five devices in a series, because there will be a delay of more than 30 milliseconds (which is the limit for what the human ear can distinguish).The MIDI-standard has no limit on how many devices can be connected together. The only restriction is where MIDI's speed problems become an audible nuisance. The computer has become the core of any major MIDI system. The computer can not send and receive MIDI signals. Therefore, a MIDI interface can be fitted on the computer seriel connection witch usually has MIDI IN, MIDI THROUGH and several MIDI OUT. Another option is a PC to MIDI cable that is fitted on the Joystick connection on the Soundcard. From the computer, the other devices are controlled using a sequencerprogram. Here one can both receive, store, edit, play, and much more. MIDI keyboard (These are also called mother keyboards). They can only send MIDI signals. There are 12 to 88 keys and buttons to send "change sound" and other MIDI messages. They create MIDI signals to other MIDI devices. Synthesizers, electic Pianos. They have a built sound generator. They can send and receive MIDI signals on 16 channels, and play up to 48 tones simultaneously spread out over 16 instruments. Some of them have built-in sequencer and can be used as a center for a MIDI system. The Sampeler sends and receives MIDI data. They record various sounds and play them at different speeds. This way, they can sound like different instruments or you can make music with sounds from other places. On these keyboards, there are several ways to modify the sound. Attack Sensitivity is becoming standard. Aftertouch read changes in pressure while the tangent is pressed. The Pitch bender change the pitch and modulation "wheel" is normaly used to add vibrato. In adition to this we have pedals, wind sensors, and all the pre-programed changes that belongs to the sound. All these data can be transmitted via MIDI to computers or other kinds of MIDI equipment. MIDI sound modules are, in practice a synthesizer or sampler without a keyboard. It can receive via MIDI IN and somtimes have a MIDI THROUGH. It can also play many sounds and instruments simultaneously and, for home use, it is often connected to a computer with a cequencerprogram and a MIDI keyboard. Drum Machine is an essential MIDI device containing a sequencer that can be programmed for different rythm patterns, that can be played with repetitions, variations, and fill in's, so we can have all the necessary rhythm to support a music number on one machine. 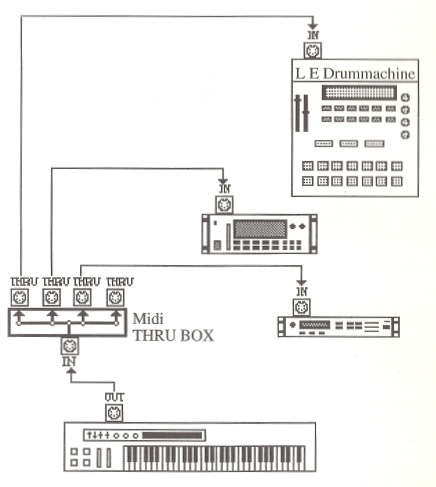 Drum machine has its own sound module with samples from a large selection of drum sounds. Some models have pads (large buttons) that you can play directly or use for programming new rythms. It was the main instrument in disco music and in recent years dance music'en taken it to its fast beating heart. It is also used a lot in studies to keep the rhythm when you get tired of listening to the drummer himself or if he is drunk. And then of course for synchronization of sequencers and other MIDI equipment. Eventually, you can get almost all types of instruments to MIDI. First came the synth, but the MIDI guitar soon followed. This could be made with a sensor behind the strings and through some electronics, guess what note was being played and forward the corresponding MIDI code. It could only understand half tone jumps and if you bended the string, did vibrato or chords, it would be a mess. 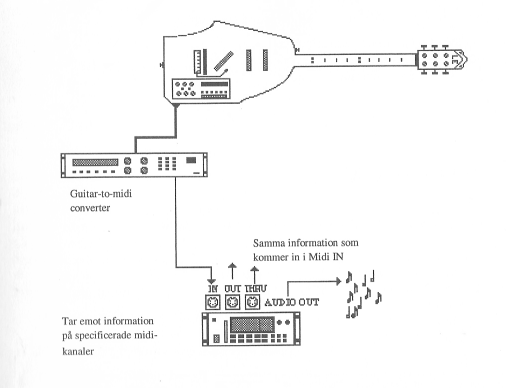 Later special MIDI guitars (as Synth AX costing a tens of thousand £) was made, but they still can not replace all the possibilities of a great guitar, all the musical expressiveness it has to offer and will always sound like "MIDI". After some time, many MIDI wind instruments(like Yamaha WX7 and Akai EWI seies) appeared, that used a blow-sensitive mouthpiece to simulate the real wind instruments in very convincing fashion. This makes it posible for a flautist to play on various wind instruments via midi without having to learn different playing techniques and he/she can also have fun with all sorts of other synth sounds from a sound canvas. 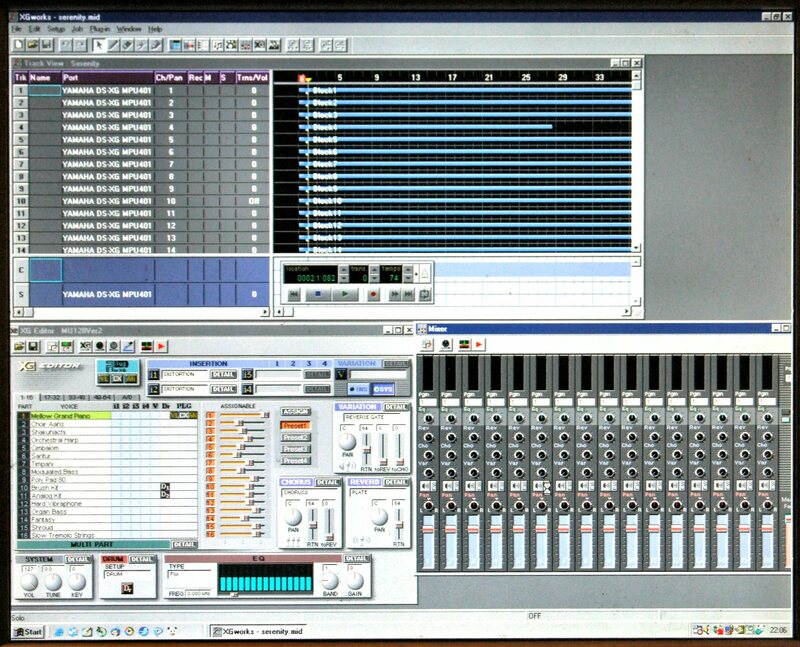 In addition, a host of other machines in connection with sound reproduction, can be controlled by MIDI data. FX-boxes can be programmed to respond to the program/sound change message or the NOTE-ON messages. A particularly important possibillity in this regard is the phenomenon of "Bulk Dump", where all settings can be sent out on MIDI and stored on disk. Then, when you come back and some dumb dude has tampered with the gadgets, you can just garb the disk and copy it all back. Tape recorders can receive remote control orders with time code and even fast-forward and rewind to a preset point on the tape, so you can sit down, in peace and tranquility in your comfortable chair and concentrate on mixing. MIDI THROUGH-box recieves a MIDI IN signal and makes copies to multiple MIDI THROUGH outputs. This is very useful for larger setups with multiple MIDI devices and it helps in avoiding the delays that comes because of serial linking. This also helps to make the layout clearer. The MIDI merger-box has several MIDI IN connectors and one or more MIDI OUT connectors. With this device you can put several keyboards and computers in the MIDI IN connectors, and get a well formated and error free MIDI signal from the output. The output can then be connected to a MIDI sound module or what ever. You must make sure that you send your data on different MIDI channels, in order to ensure that data from various devices are not mixed. 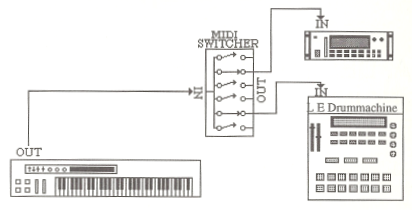 MIDI switcher (mechanical) or MIDI patchbay (electronic) has several MIDI IN connectors and multiple MIDI-OUT connectors. The idea is that you can select which inputs are connected to the outputs. In addition, the MIDI patchbay's often makes it possible to filter MIDI data so that SysEx messages and sound change messages are filtered or translated. I will now take a closer look at the core of the MIDI language and what it can do for us. MIDI is based on computer technology and therefore it is working with numeric codes (Bits, Nibbles and Bytes). In order to understand this, it is unfortunately necessary to understand the binary number system. I don't want to waste precious time on a complete totorial, so here are a few facts and those who are interested, can then bury themselves in the subject on their own. The reason why it is practical to consider code values as binary values, is that those who made the MIDI system has decided that some bits have a particular importance and if you look at the codes in the 10-number system, you will not be able to see the logic of codes values. Drop this §, if you are not interested. In the binary system can count to 1 and the next number is written as follows: 10 (= 2). A zero in the same seats will always be equal to 0 wherever it stands. To find the equivalent value in 10-number system, you add the values of the 1's acording to their respective places. LSb (Least significant bit, is the rightmost). 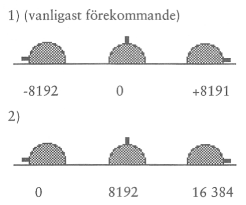 If two bytes (groups of 8 bits) are side by side, the left will have a value 256 times higher than, the one on the right, because you can count to 256 by one byte. LSB (least significant byte = least significant byte, right). Continuously register how hard a key is held for each note. Different control values for volume, blow power, pedal pressure, etc. Changing the sound on synths, but is also used as an the FX application change ect. As Polyphonic KEY PRESSURE, but gives a value per. canal. Connects or diconnects the internal sound reproduction device in keyboards. Turns off all notes, if notes hang. Choose MIDI mode. See above. SYSTEM MESSAGE (system notifications), is independant of the MIDI channels. Time Control Codes for synchronization of MIDI and film/video. Showing where you are in a song. Change the song, for example in a drum machine or sequencer. Calls to analog MIDI machines to tune themselves. End or Exit a SYSTEM EXCLUSIVE notice status. Proceeding from the point where sequencer/drum machine stopped. Send A.S. Three times/sec. So the receiver can recognize that the midi machine is there. Sending messages to the MIDI devices that do not have a manufacturer ID. This could be a machine you have built yourself. Sendsing a non-real time message to a certan Device-channel , 0 -> 127, The data send on chanel 127 is recived by all channels. Sending non-realtime communications to a specific device channel 0 -> 127, The data send on channel 127 is received by all. Nibble 2, indicating a channel number. Where sss indicates the code for the various MIDI messages and nnnn is a channel number. 1111 tttt System message, where "t t t t" indicates the type. After a status-byte, one, two or more data bytes follows, depending on it's status type. MSb,the first bit, on a data byte is always 0 (Example: 01111111 = 127 is the highest value). Indicates how quickly a key is pressed (gives the initial level of a note, attac). 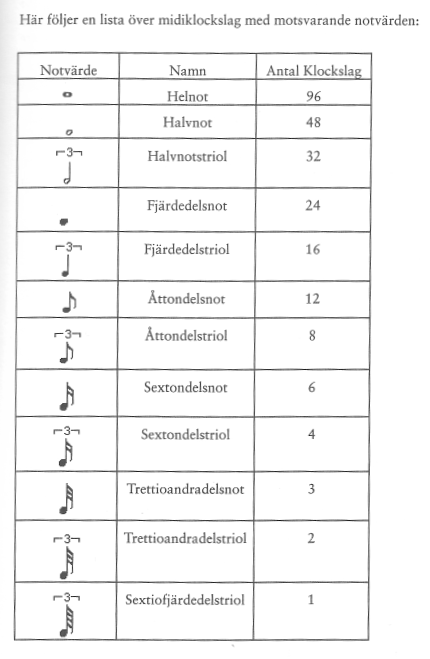 Here is a table showing the levels that are commonly used in music systems, together with the corresponding midi values. Note that if the Attack Velocity is 0, it will be perceived as a note-off message. This makes it possible to send in "running mode", where a status byte is followed by many packets of data bytes, until a new status byte is send, with the MSb = 1 is sent. The Data byte's are hereafter interpreted, based on the format belonging to the new status-byte. Sent when a note ends on a MIDI instrument. A faster release rate (high value) often makes the note fade faster, but can be programmed to do anything, using the settings in the device that receives the MIDI data. Sends a new value for each key pressed down, as soon as the pressure on any key changes. Exists only on expensive keyboards. This is Sending a lot of data and can therefore cause problems if many instruments are using the same MIDI connection. A common use for this is to control the level of vibrato, by changing the pressure after a key is pressed. Same as Note-On, but if more keys are pressed, the value of the last key is send. Sends a new value for all keys pressed (on the channel) as soon as the pressure changes. Usually the highest value is send, but some of the better keyboards calculate an average, this is called plastic dynamics. Sends a lot of data and can for example be used for vibrato control by changing the pressure after the key is pressed down. The new program number. On keyboards and sound modules this feature is used to switch patch/sound. There has been a long time without any standard for what sounds are on the program places, but Roland has attempted to introduce a standard called General MIDI, GM (General MIDI System See copy of page 73-74, not available in English, sorry), that now has become a de facto standard. Most other manufacturers have joined them, but it toke some time before this part of the MIDI system became standard. An FX machine receiving a Programe change message, may change the effect program while other MIDI machines can do other things, such as turning on a coffee machine or change the CD on the CD player(some time in the near future?). It may be a problem wether the first program is called 0 or 1, so you can get sound 15, when you ask for number 14. It is alleged that some machines can start further up in the series of numbers, but I have not seen that. Indicates the control value to be changed. (see attached copy of page 26-27, not available in english, sorry). These values correspond to a button, pedal, effect wheels or somthing else, that may be adjusted in real time by a sound or a program in a MIDI machine. The new value for the controler. Continuous Controller controls are constantly modified. Switches are switches (On/OFF buttons). Data controllers can change one step up or down on a selected parameter value. All control numbers, where it says "undefined" are reserved for future use and must not be used without permission from the MMA (MIDI Manufacturers Association), which administers the MIDI language use and development. No. 16-19 + 80-83, controllers may be used freely for special functions for their particular machines. No. 64-67, 69 and 91-95 are switches only and turns functions like(sustain, tremolo, etc.) on and off. No. 96-97 can change one up or down on a selected parameter value. See below. No. 98-101 here you can choose which parameter you want to change. A parameter can be used to configure anything. Eg. one can choose a parameter which changes any value in the programming of a synth. or put on a reverb setting of the room size and hardness. There are two types of NRPC (Non Registreted Parameter Controller) and RPC (Registreted Parameter Controller). That a parameter controller is registered, it means that the producer of the device has been approved for the use of this parameter function as part of the MIDI standard. These are the controllers you have to adjust when you want to get under the hood of today's fantastic electronic wonders. Here you can get right down to the detail and adjust all facets of the individual functions. Eg. size and shape of the room that a reverb simulates. No. 121 (Databyte = 0): Reset all controllers. Sets all control values of the channel to its initial value (Default). No. 122 (Databyte: off = 0/on = 127): Local control off. Disconnects between keyboard and sound module in a keybord, so you can play through a sound module externally without the built-in sound module getting any MIDI-data. No.123 (Databyte = 0): All notes off. Is sent when notes "hang" because they have not responded to or recieved a Note-Off message. No. 124-127 (Databyte = 0): MIDI Modes 1-4 described earlier. Least significant byte of PB.-wheel position. Most significant byte of PB.-wheel position. Together they provide for 16,384 values. Unfortunately, these values are transmitted by two systems, both used. 2nd Rest position is indicated by 8192 and values ranging from 0 to +16383. If you can find out which model the system uses, this can function to raise or lower the tone within the number of semitones that has been programmed in the "sound" settings. MIDI Time Code (MTC): TMC is designed to work with video-/film-equipment and therefore counted in hours, minutes, seconds and frames (24, 25, 30, 30drop). Frames indicates how many images per second split up in. 30drop is a speed which is 29.97 fps. second, so you drop two additional farms in every 10 minutes in order to get the time to fit exactly. Messages are sent four times each. frame, ie 120 times PPR. second at 30 f/s coding of the cues transmitted are quite complex and I will not go into detail with it. It is used when the main device for example a VCR rewinds the tape and sends the same information on hours, munutter, seconds and frames (24, 25, 30, 30drop) but only once each frame. A data message is 10 bytes, but does not burden the system as much as MTC. When it arrives at the desired location, it waits for the other machines to report that they have also reached the same time code, then it starts sending MTC again. This time code was developed by NASA to synkronisre images from different transmitting stations. Since it has become the dominant standard in radio, video and film. SMPTE splits up time in hours, minutes, seconds, frames (24, 25, 30, 30drop) and Bits (80 frame parts). It uses 80 bits for all values of one times (one time packeage). The code consists of one square oscillation whose clock frequency is normally kept within 900hz.-2400hz. Experts call SMPTE, LTC (Longitudinal Time Code). One problem with SMPTE is that you can not run slower than 1/10-1/20 of normal playback speed without the code becomeing hard to read, this is however usually only disturbs readout of some the Frame-bits and is corrected when the next correct reading the time is decoded. If you record and play SMPTE, never use any filtering or noise reduction, because it destroys the shape of the sqare. To succed in getting the three aforementioned cues to communicate with one another, some clever people has developed DTL (Direct Time Lock) and DTLe (Advanced Direct Time Lock) which is different conversion languages, that translates codes between SMPTE and TMC/Full Messages. They are available as software for computers or as hardware boxes. MIDI Cueing Messages (MTC): These codes are part of the MTC system and used to send control commands to devices such as Studio tape recorders, DVR etc. Set/delete cue points anywhere you want to be rewind to.